B&W Technology The 800 Series Diamond represents the pinnacle of our technological achievement, and the sum total of almost 50 years of research and development at the cutting edge of acoustic design. Inside the sturdy cabinet of every model is some of the most advanced technology ever to be put inside a speaker. This includes signature Bowers & Wilkins technologies such as Kevlar and Nautilus tubes, alongside groundbreaking advances in magnet and driver design. The 800 Series Diamond represents the pinnacle of our technological achievement, and the sum total of almost 50 years of research and development at the cutting edge of acoustic design. Inside the sturdy cabinet of every model in the range is some of the most advanced technology ever to be put inside a speaker. This includes signature Bowers & Wilkins technologies such as Kevlar and Nautilus tubes, alongside groundbreaking advances in magnet and driver design. Launched in 1979 The original Bowers & Wilkins 801 speaker heralded the modern era of high-end loudspeaker design. Superior drive units isolated in separate chambers produced sound of unheard-of-realism and made the 801 a fixture in demanding recording studios and the homes of serious audio enthusiasts everywhere. It's been exactly the same story with every subsequent incarnation of the 800 Series, right up to the present day. Diamond Tweeters Hard enough to cut stone and grind glass, diamond is a miracle material. Its combination of lightness and incredible stiffness also makes it the perfect tweeter material, capable of producing high frequencies way beyond the range of human hearing. Using modern scientific processes, we grow diamond under laboratory conditions to form the optimum tweeter dome shape. Diamond for Every Occasion The 800 Series Diamond represents the pinnacle of our technological achievement, and the sum total of almost 50 years of research and development at the cutting edge of acoustic design. Inside the sturdy cabinet of every model is some of the most advanced technology ever to be put inside a speaker. This includes signature Bowers & Wilkins technologies such as Kevlar and Nautilus tubes, alongside groundbreaking advances in magnet and driver design. The speaker of choice for the world's most demanding recording studios, and a legend among serious sound enthusiasts everywhere, the 800 Diamond is the top speaker in the range - and very probably the finest speaker you will ever hear. 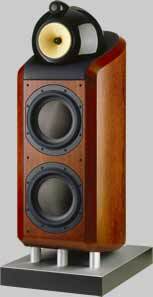 Quite simply, the ultimate loudspeaker. Studio Quality You'll find the flagship 800 Series loudpseaker at work wherever exceptional sound quality really matters, the world-famous Abbey Road Studios in London to Skywalker Sound, the Californian studio where Hollywood puts music to movies. For sheer, unadulterated realism, these professionals say it's the best there is. The Shape of Perfection The iconic design of the flagship 800 Series Diamond speaker, with drive units housed in separate, curvaceous enclosures, has its roots back in our design for the very first 800 Series speaker - the Matrix 801. Back then we discovered that isolating the units created a much purer, more balanced sound. The same principle applies today. If you're looking for a speaker with the power, clarity and presence of the mighty 800 Diamond, but your listening area can't quite accommodate its studio-sized proportions, the 802 Diamond is the answer. Retaining the groundbreaking spherical head design of its bigger brother, it's the closest you'll get to true studio sound at home. Studio Quality While the slimmer dimensions of the 802 Diamond make it an easier fit for living spaces, the basic design retains nearly all of the features of the top-of-the-range 800 Diamond, including the teardrop form of the midrange head. Molded from Marlan, a synthetic, mineral filled resin, this granite-hard enclosure is sprayed with seven coats of lacquer and polished by hand until it's as smooth as glass. The Sound of Silence As with all of the speakers in the range, the 802 Diamond features our legendary Nautilus tapering tube drive unit technology. First pioneered on our trailblazing Nautilus speaker, the tubes work like horns in reverse, minimising colouration by soaking up excess sound energy from the back of the driver. So that all that emerges from the front is the most fully formed, focused and pristine sound. The 803 Diamond might look almost as imposing as the 802 Diamond, but thanks to its smaller footprint and more traditional cabinet design, it will fit more comfortably into a home environment. With three massive 7 inch Rohacell bass drivers, it delivers almost as much bass as the 802 Diamond, filling even the largest of domestic rooms with rich, stunningly lifelike sound. Home Studo Speaker The design and proportions of the top two speakers in the range are derived at for sound acoustic reasons - but understandably, not everyone wants the visual disruption that such a radical piece of furniture can create in a home environment. The 803 Diamond takes up less space and is arguably easier on the eye - but thanks to its three bass drivers, it generates a sound that's almost a match for its bigger brothers. Force of Attraction For the 800 Series Diamond range, we've refined the science of magnet motor design to a fine art. Each of the 803 Diamond's three bass drivers are powered by a dual magnet motor system, creating a more symmetrical magnetic field and reducing harmonic distortion. Meanwhile a unique quad magnet design keeps the tweeter running cool and smooth, even at the highest frequencies. As wonderfully versatile as its smaller brother the 805 Diamond, the elegant, floorstanding 804 Diamond has an even more commanding acoustic presence, thanks to a true three-way design incorporating two Rohacell bass units, an FST midrange and a diamond dome tweeter delivering pin-sharp clarity all the way up the frequency range. A brilliant all-round performer for any occasion. The hypothetical perfect tweeter is one that balances infinite stiffness with near-zero density. Only one material on earth comes close to matching those properties: diamond. Thanks to modern scientific techniques, we can grow diamond, like a crystal, to form the optimum tweeter dome shape. The result is truly exceptional sound at high frequencies. And it comes as standard with every speaker in the range, including the 804 Diamond. For the 800 Series Diamond range, we've refined the science of magnet motor design to a fine art. Each of the 803 Diamond's three bass drivers are powered by a dual magnet motor system, creating a more symmetrical magnetic field and reducing harmonic distortion. Meanwhile a unique quad magnet design keeps the tweeter running cool and smooth, even at the highest frequencies. You asked for it. And now you've got it. The 805 Diamond is an industry world-first - the only speaker of its size and type to incorporate true studio-grade technology in the form of a diamond dome tweeter. Experience remarkable, lifelike sound from a discreet speaker that fits almost anywhere. Diamond dome tweeters have long been considered an exclusive luxury in the world of audio - a refinement to be reserved only for the most expensive, studio-sized loudspeakers. No longer. The 805 Diamond is nothing less than a revolution in speaker design: the first speaker of its size and at this price point to come with a diamond tweeter. Because studio-quality sound shouldn't just be for studios. Small but perfectly formed, the 805 Diamond will fit almost everywhere. Tucked away on a bookshelf or positioned on its specially designed stand, it's perfect for smaller listening spaces. And it will serve equally well as the rear channels of a home theatre system. With 805 Diamond, you can now bring superb, breath-takingly realistic sound to places you never thought possible.